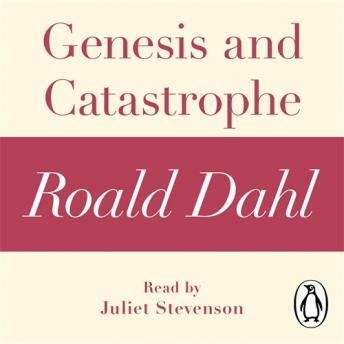 Penguin presents the audiobook edition of Genesis and Catastrophe by Roald Dahl, read by Juliet Stevenson. In Genesis and Catastrophe, Roald Dahl tells a sinister story about the darker side of human nature. Here, a baby is born and his worried parents, who have lost children before, are concerned for his future . . .
Genesis and Catastrophe is taken from the short story collection Kiss Kiss, which includes ten other devious and shocking stories, featuring the wife who pawns the mink coat from her lover with unexpected results; the priceless piece of furniture that is the subject of a deceitful bargain; a wronged woman taking revenge on her dead husband, and others.